Hal McRae. Hal McRae was born on July 10, 1945 in Avon Park, Florida. He was drafted by the Cincinnati Reds in 1965 making it to the big leagues in 1968 for brief 17 games. 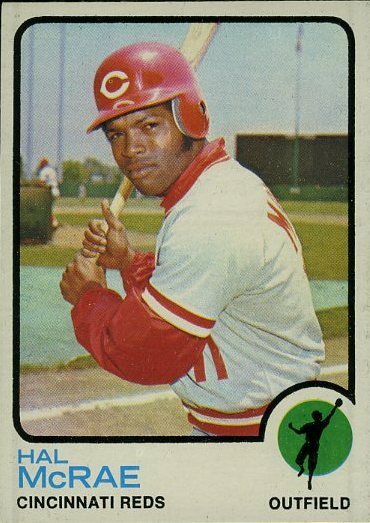 He would spend three more seasons with the Reds, winning two pennants in the early days of the Big Red Machine, playing as a reserve outfielder. McRae hit .248 with 8 HRs & 23 RBIs for the 1970 NL Champion Reds, playing in 70 games. He had a great World Series that year against the Baltimore Orioles batting .455 (5-11). In Game #2 he had two hits including an RBI double, then had another double driving in two more runs in Game #5. McRae hit .278 with 5 HRs & 26 RBIs in the 1972 season, having another good World Series batting .444 (4-9) with two RBIs against the Oakland A’s. In November 1972 he was Traded by the Cincinnati Reds along with Wayne Simpson to the Kansas City Royals for Roger Nelson and Richie Scheinblum. McRae arrived in Kansas City just as the Royals were entering their best days. He spent fifteen seasons there, winning a World Series in 1985, an AL Pennant in 1980 & six AL West titles. 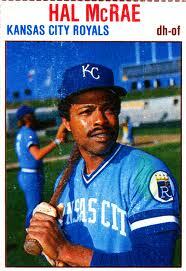 He would bat over .300 seven times, including a career best .332 in 1976 coming in second to team mate George Brett. He would make three All Star teams, lead the league in doubles twice (1977 & 1982) RBIs once (1982) on base % once (1976) & hit by pitches once (1977). In the 1980 World Series he hit .375 against the Phillies & went 0-1 in the 1985 World Series against the Cardinals. In his 19 year career McRae batted .290 with 2091 hits 484 doubles 66 triples 191 HRs 1097 RBIs & a .351 on base %. As a young kid, Brian McRae became a big fan of his dad’s teammate, Pete Rose during his years in Cincinnati. He was a good athlete in high school, playing football as well as baseball. He decided if he wasn’t chosen as a first round draft pick, he would go to college. He wasn’t even around on draft day, not expecting anything, when he got a phone call that he was actually was drafted in the first round, by the Kansas City Royals. He was originally a second baseman getting converted to an outfielder in the minor leagues. His MLB career certainly wasn’t as good as his father’s, the switch hitting McRae never made the playoffs & was predominantly a singles hitter. 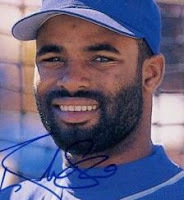 He was the Royals everyday centerfielder from 1990-1994, playing for his father, Hal McRae who was the teams manager. He had his best season there in 1993, batting .282 with 177 hits, 12 HRs, 9 triples, 14 stolen bases, & 69 RBIs. In 1994 he hit .273, then as the 1995 season was about to start, he was traded to the Chicago Cubs for future Met, Derek Wallace. McRae hit well in his first season at Wrigley Field leading the NL in at bats (580) batting a career high .288 with 167 hits (4th in the league) with 12 HRs 48 RBIs & 38 doubles. McRae would hit 30 or more doubles for the next three seasons. In the outfield he posted a .992 fielding % (4th in the NL) leading all outfielders with 345 out outs. The next year he hit 17 HRs with 66 RBIs batting .276. His numbers dropped during the 1997 season, & that August he was traded to the New York Mets along with Turk Wendell & Mel Rojas for Lance Johnson, Mark Clark & Manny Alexander. 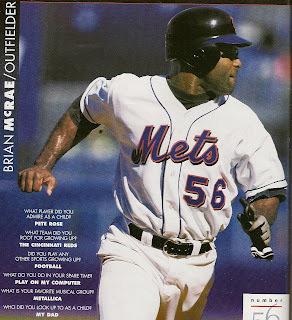 In his first game as a Met he went 3-4 with a triple, a walk and RBI against the Houston Astros at Shea Stadium. 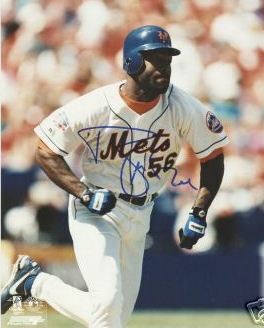 On August 23rd he hit his first Mets HR coming against the Padres at Shea Stadium. On the home stand he hit three more including two against the San Francisco Giants in the Mets 15-6 win on August 27th. 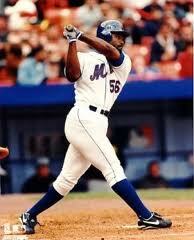 He closed out 1997 hitting .248 with 5 HRs 4 doubles & 15 RBIs for the Mets in 45 games. During his days with the Mets Brian’s favorite rock band was Metallica. 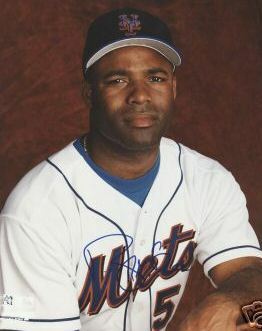 In 1998 after missing Opening Day he went on to play in 159 games, as the clubs centerfielder. In the final week of June he hit four HRs driving in six runs gathering up seven hits. In mid July McRae hit HRs in back to back games in a home series against the Montreal Expos, leading New York to wins in both games. At the end of the month he once again homered in back to back games, this time in Chicago & at home against the San Diego Padres. In September '98 the Mets made a run for the wild card race into late September. On September 19th McRae hit a 9th inning game tying two run HR off the Astros Billy Wagner in Houston. Later in the top of the 13th he put the Mets ahead with a double scoring Mike Piazza & Edgardo Alfonzo. He ended the year leading the Mets in doubles (36) triples (5) & stolen bases (20). Personally he posted career highs in HRs (21) & RBIs (79) while batting .264 with 80 walks & a .360 on base percentage. In 1999 the Mets were a better team with more players who could play the outfield. He struggled in April batting just .197. In May he hit safely in 15 of 19 games & at the start of June drove in a run in all three games of the Subway series. On June 13th he hit a two run HR against the Boston Red Sox leading to a 5-4 Mets win. Three days later he broke a 6th inning tie with a two run single in Cincinnati, driving in three rusn in the Mets 5-2 win over the Reds. On July 31st after playing in 96 games he was only batting .220 with 8 HRs 36 RBIs & 320 on base % . He was carrying a $3.5 million salary and the Mets decided he wasn’t in their future. McRae was traded to the Colorado Rockies for Daryl Hamilton. Hamilton would be a key role player in the Mets Wild Card run as well in the post season. A week later McRae was shipped to the Toronto Blue Jays, where he was their centerfielder but eventually lost his position to Vernon Wells. He was released and his career was over by 2000 at the age of 32. McRae played ten seasons batting a lifetime .261 average, with 1336 hits, 103 HRs, 264 doubles, 37 triples, 493 walks, a .360 on base %, 532 RBIs, & 196 steals. As a Met in parts of three seasons, he hit .249 with 34 HRs, 130 RBIS & 53 doubles in 300 games.